Search and adopt a Pembroke Welsh Corgi near you. Active dog, giving an impression of substance and stamina in a small space. Strong, low-set, sturdily built. Expression interested and intelligent. Never vicious nor shy. Bred for herding cattle, Pembroke Welsh Corgis can easily be recognized by their short statures. 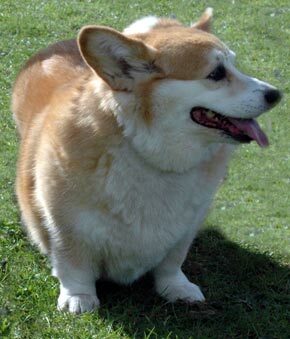 Known for their cute, stubby legs, Pembroke Welsh Corgis are perhaps one of the shortest dogs in the world. Originally bred to herd livestock, they have assisted farmers for hundreds of years; in fact, some speculate that their ancestors been around as early as the 10th century. Referred to as “heelers”, they drive cattle and sheep by nipping at their heels (their short stature allows them to avoid their kicks). Instead of circling around the animals like most other herding dogs, they tend to work from behind to drive them forwards. While some continue their duties on farms, others have adapted to a more relaxed lifestyle. Playful and outgoing, they make excellent family dogs. Not only do they get along with everyone they meet, but they also tend to be friendly with other animals. Considering this, it’s no wonder why Queen Elizabeth II has taken such a liking to the breed. Ever since she was young, Her Majesty has had a soft spot for Corgis. When she was ten years old, her father, King George VI (then the Duke of York) brought home the first Corgi, Dookie. Since then, she has owned more than two dozen of these short-legged canines, many of whom are Dookie’s descendants. These dogs can be naturally bossy. You can easily see why, however, when you consider the fact that they were originally bred to herd livestock. Inherently, it is their instinct to nip and manipulate animals much bigger than themselves. Slightly overbearing, they will not hesitate to boss others around—regardless of their size. Even towards humans, they can be pushy without proper training. For instance, it’s not uncommon for them to demand treats or talk back. Given the chance to make all the decisions, they will!